This Roman Centurion Helmet is from 100 B.C. to 300 A.D. 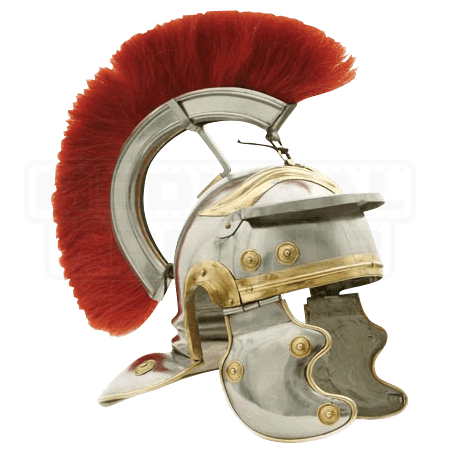 The main officers of the Imperial Roman guard were the Centurions, each in charge of 100 men, hence the name. These Centurion Generals wore adorned plumed helms that could be easily seen in battle. This full size historical hand crafted helm is as glorious as the originals with its full crest and brass accents. This Imperial Gaelic-Type helmet was the choice of officers who led the Roman armies. The flamboyant crest actually served a purpose for the conspicuously practical Romans. It made the officer more visible to his men while offering the illusion of height that helped him appear more commanding. The color of the plume signified different things. During some periods the color specified the officers rank, and at other times it designated units. The colors could be red, white, black, brown, reddish brown and others, as well as two or more colors mixed. At times the plume would run from front to back, and at other times it would be mounted crossways. This Roman Centurion Helmet features a red horse hair plume and is hand made of high carbon steel. The Roman Centurion Helmet is fully wearable.